Brick maps were introduced in PRMan 12.0 as a 3D data structure for textures on surfaces and in volumes. PRMan 13.0 extended the use of brick maps to also allow their use as a geometric primitive (on equal footing with the other geometric primitives such as quadrics, polygon meshes, NURBS patches, and subdivision surfaces). Being a geometric primitive, brick maps can be rendered (using the Reyes algorithm), ray-traced, motion blurred, shaded, displacement mapped, and most of the other things that geometric primitives can do. The purpose of this application note is to provide examples for the use of brick map geometric primitives using PRMan 13.0 and higher. We recommend storing P and N channels in the brick map if it is intended for use as a geometric primitive. This gives a higher accuracy of the rendered brick map surface, particularly along the silhouettes. The P and N channels can either be explicitly baked into the point cloud, or the -addpn option to brickmake will add them automatically. More on this in appendix A. Here is a short RIB file to illustrate the use of the brick map as a geometric primitive. The appropriate level in the brick map is chosen based on the screen size of the brick map geometric primitive and the shading rate. During rendering, the bricks are read on demand at the appropriate size and cached in a brick cache. Implementation detail: Each brick voxel is rendered as a disk. This can be seen more clearly if the shading rate is increased. 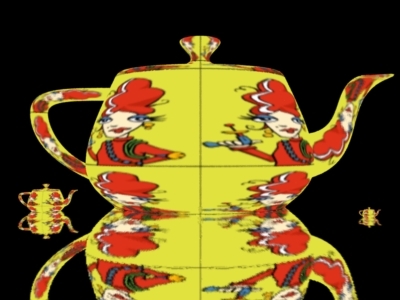 The images below are rendered with shading rate 100 and 100000, respectively, and the disks can be seen clearly. In the left image, some of the disks along the edges are rendered as partially transparent. This is due to lerping of two different levels of detail of the brick map. 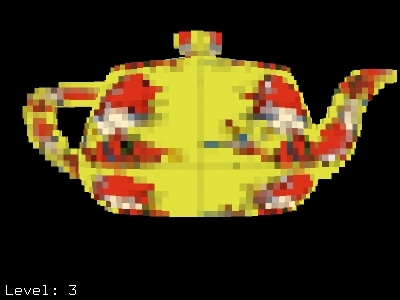 In the image on the right, all three teapots are rendered using the coarsest level in the brick map (8x8x8 voxels). 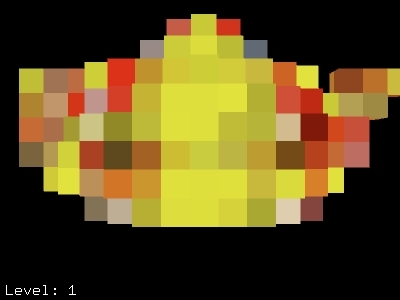 If P and N aren't baked among the data, each brick voxel is rendered as a disk centered at the voxel center and facing the camera - as illustrated below. This inevitably leads to bloated silhouettes. For long thin geometry such as cylinders there is an additional source of silhouette bloat. This happens because the points along the cylinder are much further apart than along the radial direction. The radius values have to be large enough that the disks cover the space between points along the cylinder. This unfortunately gives point radii that makes the thin geometry bloat a lot. Creating a brick map from this point cloud will give brick voxels that are much larger than the width of the cylinder. 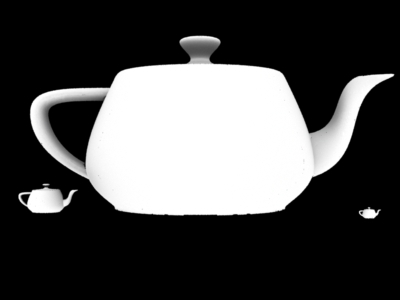 The workaround to avoid this is to reduce the ShadingRate when the point cloud is baked and rendered. This will of course lead to larger point cloud and brick map files, but it is unfortunately the only way the brick map geometric primitive can be made to represent very thin geometry correctly. Rendering brick maps as blobby volumes is covered in detail in the Volume Rendering application note. The previous example showed ray-traced reflection of a brick map geometric primitive. Brick map geometric primitives can also cast ray-traced shadows. 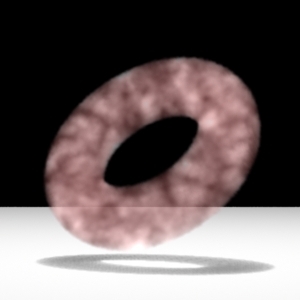 As another example, we can add a reflecting ground plane to the rib file for the semitransparent torus brick map. When a ray hits a semitransparent brick voxel it automatically continues to the next voxel, etc. 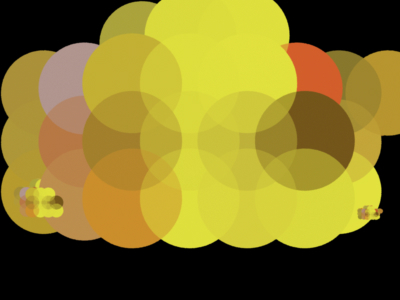 The colors and opacities are composited along the way. 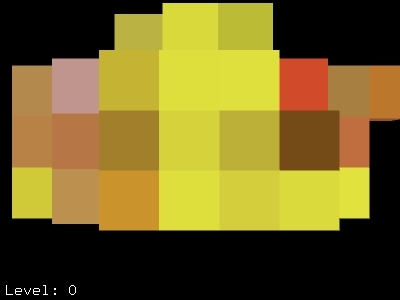 This corresponds to ray marching through the volume of the brick map. Brick map geometric primitives with opacity data can also be used to cast semitransparent shadows. The shadow rays are automatically propagated through the brick map voxels, and the opacity values are composited along the way. The indirectsurf shader simply calls the indirectdiffuse() function and assigns the result to Ci. The resulting image is shown below. The colors of the teapot-shaped brick map geometric primitive are bleeding onto the ground plane. At the present time it is not possible to render brick map geometric primitives with deformation motion blur. It might be implemented in a future release. In the previous examples, the brick maps "inherited" their color and opacity from the voxel data. However, it is also possible to run shaders on the brick map geometry (just as for other geometric primitives). 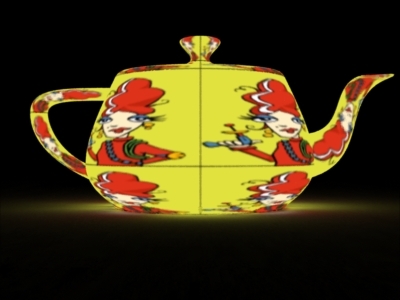 The light source shader traces shadow rays; the ray-traced shadows are most clearly visible at the base of the spout of the largest teapot. 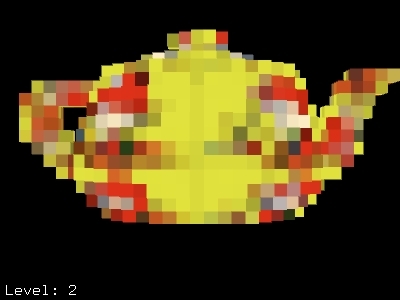 Since the brick voxels are a rather coarse approximation of the true surface, the ray tracing bias has to be rather high to avoid "surface acne" due to false self-intersections. Finding a proper value for the ray tracing bias is a general problem for shading of brick map geometric primitives. The visual result of running the constant shader (as shown here on the smallest teapot) is the same as when running no shader. However, running the constant shader will take longer than no shader, mostly due to shader set-up overhead. If (s,t), (u,v), Pref, or other parameters are needed for the surface shader they have to be baked in the brick map data - similar to how P, N, Cs, and Os were baked in this example. 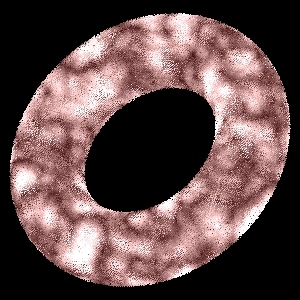 Finally, here is an ambient occlusion example. The shader is replaced with a shader that computes ambient occlusion using the occlusion() function. Again, ray tracing bias is an issue; it must be set large enough to avoid false self-occlusion. Beware that computing ray-traced ambient occlusion and indirect diffuse illumination on brick map geometric primitives can be rather slow since no information is shared between shading points (maxvariation is ignored). This example shows that fully transparent and fully opaque voxels are rendered correctly. However, semitransparent voxels can end up being rendered such that they look too opaque. This is because each surface point can be stored in up to eight voxels, i.e. surface data are often stored two voxels deep. When those voxels are rendered they are alpha-composited using their (baked or assigned) opacities. 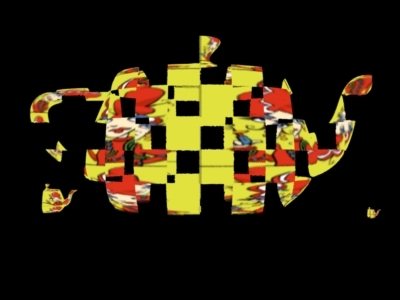 The end result is too much opacity. If the brick map contains semitransparent volume data, the brick map should be generated as a volume brick map (using the brickmake command-line option -addpresence 1) for the opacity of semitransparent voxels to be correct. See the Volume Rendering application note for the details. It is often advantageous to run the displacement shader when the brick map geometry is created (as a point cloud). But it is also possible to run a displacement shader on the brick map geometric primitive, as shown in the following example. There are a couple of limitations on the use of displacement-mapping on brick map geometric primitives: 1) If the displacement shader gives discontinuous (non-smooth) displacements, the result can be "torn" geometry, i.e. a surface with holes. 2) Ray tracing of brick maps with displacement shading is not implemented (the displacement will be ignored for ray tracing). The vectors dPdu and dPdv are (1,0,0) and (0,1,0), respectively, transformed according to the world-to-camera transformation. (Length(dPdu) * du) and (Length(dPdv) * dv) are smooth approximations of the size (in camera space) of the brick voxels. Currently the functions Du() and Dv() always return 0 when run on a brick map geometric primitive. This may change in the future. A fundamental problem with PRMan (and similar renderers) is that it cannot simplify complex geometry. 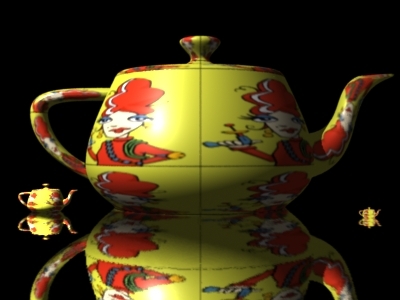 For this reason, level-of-detail representation was introduced in the RenderMan specification. But the existing explicit level-of-detail method requires that the objects are modeled multiple times (with different amounts of detail). Here we will show that brick maps can sometimes provide a more convenient automatic level-of-detail representation. Imagine a collection of complex objects that are only a few pixels large in most frames, for example, an armada of spaceships that have been individually modeled with full details, including all rivets and bolts. Each spaceship is seen up close in a few frames of a shot, so the details are required sometimes, but, in each shot, most of the spaceships are distant and only cover a few pixels. Now imagine that there is no time to model simpler versions of the spaceships due to production pressures and deadlines. If the fully detailed spaceships are used for rendering, their entire definitions will be read in (for example NURBS patch knot values or subdivision base meshes), converted to geometry, shaded, and rendered. Since there are so many spaceships and they are all specified in full detail, PRMan will soon run out of memory. In contrast, brick maps have no overhead: no NURBS knots, no subdivision base mesh or the like. If a brick map geometric primitive only covers a few pixels, only the top level bricks will be read in. PRMan automatically chooses the appropriate level in the brick map (based on size on screen or ray differential). If we get too close to a brick map (closer than the detail level the data were originally generated at), the finest brick map level is insufficient. The needed data are "missing", and the disks that represent the finest brick voxels become visible. The solution to this problem is to use the original geometric primitive in that case. For any single frame, there will be only a few objects that require the full, original object definition. Here detail1 and detail2 determine at which size the brick map fades out and the original geometry fades in. The brick cache is shared between brick map geometric primitives and brick map textures. This is natural since the bricks are the same underlying data structure. The memory size is specified in kilobytes, so the example above is 10 MB (same as the default size). As usual, the option overrides the rendermn.ini setting if both are specified. More details and advice regarding brick cache sizes are described in the Baking 3D Textures application note. Constructive Solid Geometry (CSG): the brick map geometic primitive cannot be used for constructive solid geometry. Backface culling: "sides 1" can only only be used for backface culling of brick map geometric primitives if the brick map contains normal data N.
Deformation motion blur is not implemented. 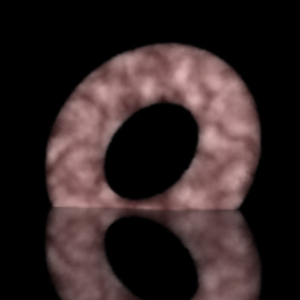 If the displacement shader gives discontinuous (non-smooth) displacements, the result can be "torn" geometry i.e. a surface with holes. Semitransparent (surface) brick maps can look too opaque. (This is explained in the Opacity section.) However, the new blobby volume brick maps introduced in PRMan 15.0 render with correct extinction-dependent opacity - see the Volume Rendering application note. 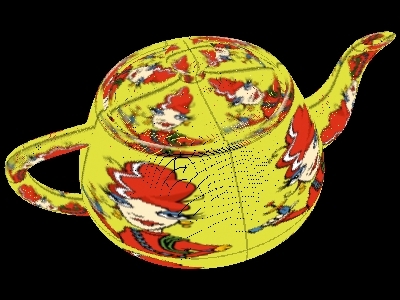 Ray tracing bias: due to the relatively coarse voxelization of the surface geometry represented by a brick map, rays leaving a brick map geometric primitive can incorrectly hit the same brick map. This problem is significantly reduced if the brick map contains P and N data. Otherwise the only way to avoid such self-intersections is to set the ray tracing bias value rather high. When executing a shader on a brick map geometric primitive, the Du() and Dv() functions always return 0. Q: How do I create a point cloud file? A: Point cloud files can be generated in several ways: a) By rendering a scene with shaders that call the bake3d() function. b) By some stand-alone program that writes data points using the point cloud API described in the Baking 3D Textures application note. Q: How do I create a brick map? A: Brick maps are created from point cloud files using the stand-alone program brickmake. Q: Can I go the other way, i.e. create a point cloud from a brick map? A: Yes. If you assign a surface shader to the brick map primitive, and that shader calls bake3d(), you can generate a point cloud with one point pr. brick voxel. 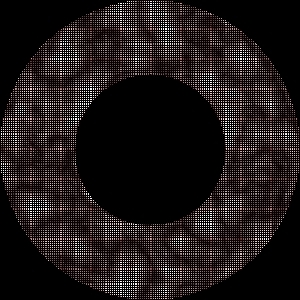 You can adjust the number and density of the generated points by changing the shading rate and/or image resolution. Q: Is there a brick map API? A: Yes and no. There is an API for reading brick maps - see The Brick Map File API. However, there is no API for writing brick maps since that would be hard to do efficiently: if you insert data at one level in the brick map all other levels have to be updated accordingly. Q: When I render my brick map, it only renders the top level brick - no matter how I set the screen resolution and shading rate. What's up with that? A: This can happen if some of the points in the point cloud (that was used to generate the brick map) have very large radius values. Try to eliminate the excessively large radii. For ease of reference, here is the shader and RIB file that were used to generate the textured teapot brick map. We recommend baking the positions P along with the normals N and other data for brick maps that are to be used as geometric primitives. The variable names must be "P" and "N". These extra data enable the rendered brick map to better approximate the original surface, and also reduce trace bias issues when ray tracing the brick map geometric primitives. A point cloud is no longer required to have explicit P and N channels with this data; instead, the brickmake -addpn command-line option can add them to the brick map even if the channels are not present in the point cloud. The brick map can be inspected using the interactive viewing program brickviewer - as shown in the first figure at the beginning of this application note. 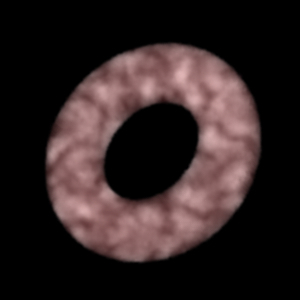 For easy reference, here is the shader and RIB file that were used to generate the brick map for the semitransparent torus. In this example, the color is varying (modulated by a procedural marble texture) while the opacity is constant. 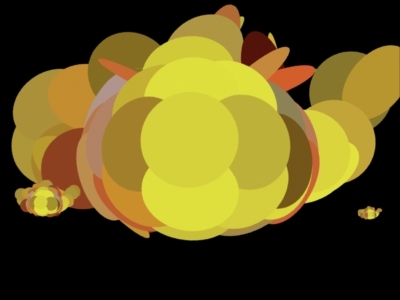 A more correct model of an inhomogeneous volume would have constant color but varying opacity.